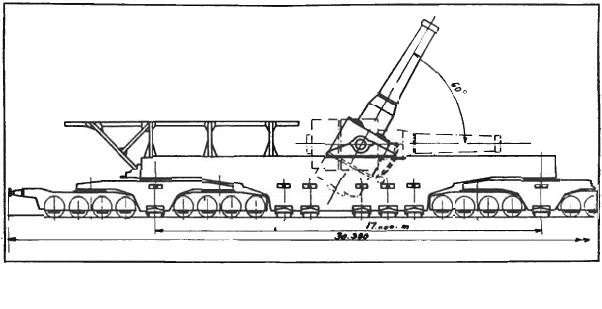 The Obusier de 520 modèle 1916 should become the biggest French railway gun in the First World War, but the first prototype exploded, the second one was not ready in time to be used. In the course of the continuing war of positions on the western front and the increasingly fortified positions and bunkers of the German army, it became apparent that even the heavy railway guns of the French army which gradually arrived did not have sufficient penetrating power. Thus the French High Command demanded ever larger guns with ever more penetrating power from the economy. The company Schneider began thereupon in the middle of 1916 with the development of the Obusier de 520 modèle 1916. This railway gun was to receive a caliber of 520 mm and represented thereby the largest gun built up to then. The gun should have fired grenades weighing between 1.370 and 1.654 kilograms to destroy even the strongest German bunkers. Such a large railway gun, however, required a significantly modified construction of the wagons. Until now only two wagons were connected with a steel scaffold. Now a total of 4 4-axle wagons had to be taken and connected in order to carry and move the weight of 263 tons. 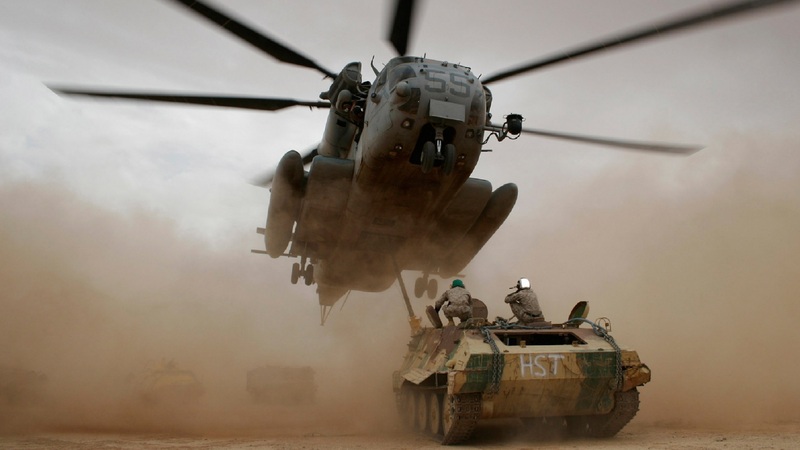 In order to be able to absorb the enormous recoil, the designers used several recoil systems. Thus, a combination of cradle recoil and sliding recoil was used in conjunction with anchoring the wagons to the tracks. After one shot, the gun's recoil system served to absorb most of the recoil, while at the same time the entire gun slid backwards about one meter over the tracks. To insert a new grenade into the breech, the barrel had to be lowered completely and a new grenade could be introduced via a trolley system mounted behind the gun. After loading, the gun had to be re-aligned. Due to the many innovations and technical adaptations, the construction of the first prototype was delayed more and more until it was finally completed at the end of 1917. 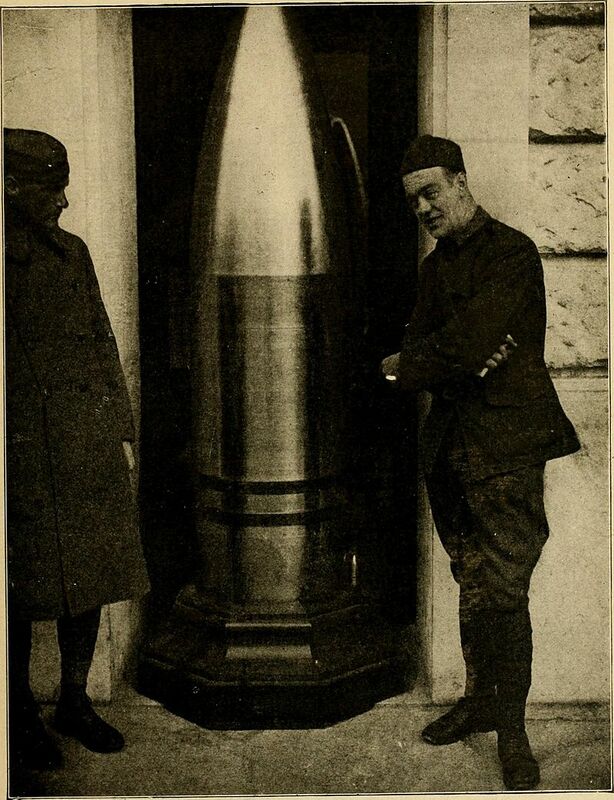 It was not until July 1917 that testing and shooting exercises were carried out until an accident occurred on the test site in Quiberon and the gun was destroyed. A fired grenade exploded early when it was still in the barrel of the weapon. Although the second prototype was completed during the war, the tests were completed after the German Empire had already capitulated. Subsequently, the railway gun was stored by the French army in one of its depots. After the outbreak of the Second World War, the railway gun was part of the French mobilization plans. However, it was too late to make the railway gun operational again, so that the German Wehrmacht could capture it after the invasion of France in the factory of the Schneider company before it was even fully operational. Under the designation 52 cm long howitzer (E) 871 (f) it was put into the service of the Wehrmacht and after the beginning of the war against the Soviet Union it was also brought to the Eastern Front. There it was used from 21 November 1941 for the bombardment of Leningrad after its encirclement. As already with the first prototype also on 5 January 1942 with the second gun a grenade exploded still while this was in the barrel and destroyed thereby likewise the entire weapon. The remains were found by the Soviet army in 1943, but they were no longer used for the destroyed railway gun.